The parish of Grace Church was formed in the Village of Canton, NY in 1836 by 19 men who met under the leadership of the Rev. Richard Bury. 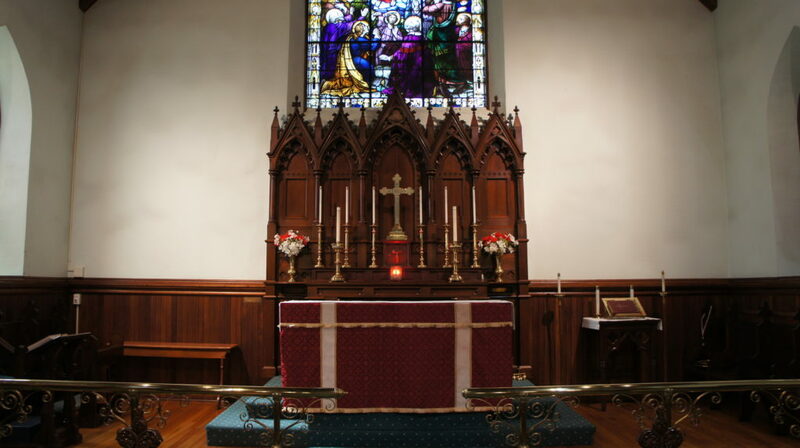 The Church was incorporated as a Parish of the Diocese of New York supported by Trinity Church in New York City. The Diocese of Albany, in which it is now located, was later formed in 1868. The first Church, a wood frame structure, was erected on the site of the current building on East Main Street in 1841. This chapel was consecrated by the Rt. Rev. Benjamin Onderdonk, Bishop of New York, in September of 1842. When the current Church was constructed, the first chapel was moved to the rear of the lot facing Church Street to be used as a Parish House. It has since been demolished. Shortly after the current Church building was constructed, the vestry purchased the large corner lot adjoining the property to the east. On it was a small house, which was enlarged in 1855 to serve as the first rectory. In 1887, that building was replaced by the current 2 1/2 story frame building, serving as a vestry for many years. Grace Church, with Transformation House Ministry, is currently working to setup a three year pilot “Women’s Halfway House” which will be the first of St. Lawrence County’s first women’s shelter dedicated to women recovering from drugs or alcohol addiction. Grace Church was completed in 1903 in the Gothic Revival style. It architect was Richard Hubbard of Utica, New York and the stone was quarried locally. It embodies many characteristics of the local English Parish Church form, including low, rectangular, broad, gabled main block with square castellated corner tower, rusticated stone construction and pointed-arch window and door openings. Distinctive characteristics specific to this building include its cross-gabled rear-section, deeply recessed centered main entry on its gable end and stained glass windows. The interior of the building is also in keeping with the parish Church tradition of decorative wood ceiling, exposed wood trusses and wainscoting. It is finished in cherry thanks to a gift from James Spears of Canton. choir stalls are made of solid oak. 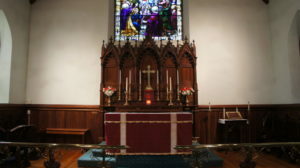 The rood cross, featuring the Calvary Group, stands above the steps leading to the altar and was given in memory of St. Lawrence County Judge Leslie Russell.